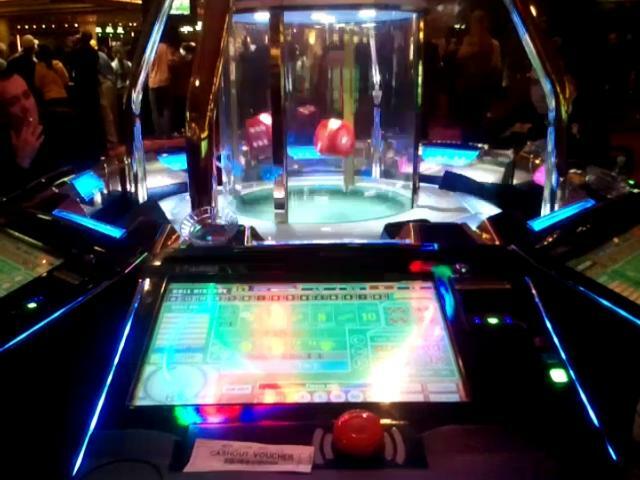 The new Las Vegas Craps game is a huge hit. We should have seen this one coming. 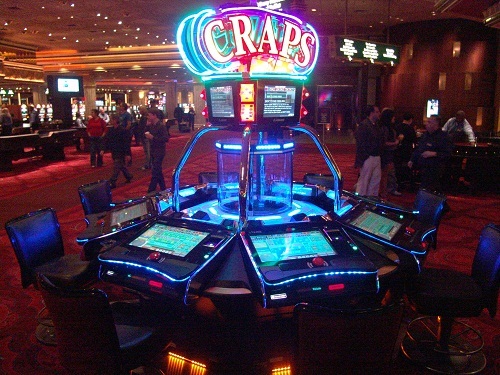 Craps is the most exciting game in Las Vegas, Everyone knows that but not Everyone will attempt to play it. It seems confusing, it can be very crowded and if the game is good You better not need to use the restroom. Everyone has walked by a traditional craps table and heard the screaming but how can You join in? Normally You can't, once its hot its too late to squeeze in. Who wants to walk up to a full table and throw money down just to see Everyone else look at You like You are slowing them down? Craps hasn't changed much since its invention until the last few years. The biggest invention for craps was Rapid Craps but it never caught on. This new craps game is HOT and suddenly is the most popular game in Vegas. It really doesn't have an official name. You might call it "Press the Button" or "shoot to win" but there is no official name. 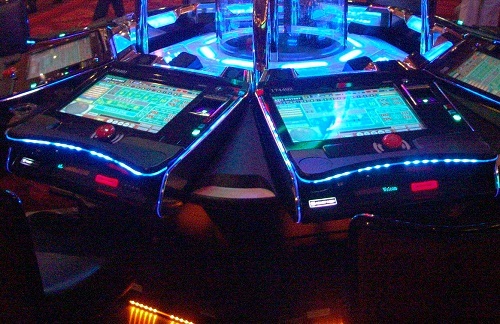 A rare empty New Craps game. This was before the game caught on. The new craps started out slow, when I would play I could get a seat 24 hours a day without problem. Now its almost impossible to get a seat at night. People will stand behind You waiting for Your seat making it difficult to use the restroom if You are by Yourself. Unlike rapid craps this game had no bugs from day one. You can bet everything in this game that You can in Live traditional craps game. And You do not have to throw "The Boys" a bet. As You can see from the monitor below, its very well laid out. Place Your bets just like on a traditional craps table but without Everyone knowing Your bets. The game allows players to make bets just like on a traditional table then when the betting time runs out the dice begin to shake and You hear the Lady say "Press the Button" . The shooter is rotated around the table just like in traditional craps and that shooter is the one that will press the button to make the dice pop in the air. 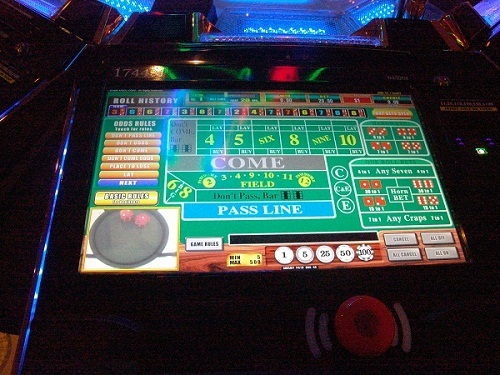 The popularity of this new game is evidence that most People do not like the rubbing of body parts with strangers that is likely the case on a traditional craps game. And the fact that most People would rather sit than stand, this new game is just what lazy is all about. Note the distance between players due to the octagon shape of the table (below). Because of the Octagon shape of the table, No One will be rubbing against You and even a smoker won't be much bother. As You can see in this video when the glass is dark, it is time to place Your bet. When the light comes on, no more bets can be made then the dice begin to shake, then pop up to make the point. Here You can see the Dice as they are bounced, when they land, the point is made. Don't be a dork (like Me)! Only the "Shooter" is suppose to press the button. If Your button lights up, then You are the "shooter" and when the Lady says "press the button" it is Your turn to do just that. On My first few times playing this game, i pressed the button every time I heard "press the button", little did I know that I was being a dork and my button was not really working because it was not my time to be the "shooter". If You play this game often while on Your Vegas vacation be warned that when You return home, You will constantly hear "Press the Button" over and over in Your head. Who has this new awesome Game? At First all the MGM Resorts Properties have it. Then Hard Rock put it in then removed it. Now all of the Caesars Group has it. For a period of time this was the absolute hottest game in Vegas, it is now just "very popular". You can find it in the unlikely of places like Slots a Fun.